As a book worm, there’s nothing I love more than when a set of characters I’ve fallen in love with are reunited in another instalment of that series. I do love imagining what might have become of the characters, but I love reading about their next adventures more. As a writer when you write a series of book, you get the same feeling. It’s like catching up with old friends and hearing about what they’ve been up to. After I’d finished Millie and the American Wedding, I felt that the story in real-life wouldn’t have finished there. I knew that I had to write a sequel, but when I tried to think about what would have happened, I kept wondering how the characters had met in the first place, and what had happened when Millie and Rob got together at first. And that’s when it hit me, I had to write a prequel. 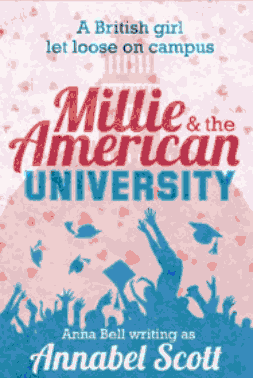 I’ve just released Millie and the American University which is the prequel to Millie and the American Wedding. Set seven years before the first book, it was fun to go back in time and see how the characters had all met. It was also a great opportunity to play around with their personalities. In the new book, the characters would have been in their early twenties before they got their careers and real-world problems. I know how different I am from my twenty-one year old self *cringes in horror at the memories* and so I had to adapt my characters too. Going to university is a rite of passage for anyone who goes and I felt that Millie’s year abroad would have caused a massive change in her personality. That was her opportunity to grow in confidence and come out of her shell. I was scared at first about writing a prequel as people would know what comes next in the story. but then I thought, imagine if Sophie Kinsella wrote a prequel to Confessions of a Shopaholic, I love anything with Becky Bloomwood in and I’d love to read it. I read Chrissie Manby’s Secret Life of Lizzie Jordan after reading the sequel Getting Over Richard, and I enjoyed reading them in the wrong order. It was great to find out where the characters had come from and how they’d got together. I think if a reader really connects with the characters that they just enjoy reading more about their lives. I’m intrigued about new readers and whether they’ll read Millie and the American Wedding before or after the prequel. Either way, I hope that they enjoy revisiting the characters as much as I did when I wrote it. Millie and the American University is available now.